This has been principally used by experts for quite some time and is likely to get popular this year. We all speak of losing fat, gaining lean muscle mass and working in the fat burning zone. But what exactly is a fat-burning zone and how do we find ours? The principle is very simple: A human heart beats at maximum rate of 220 beats per minute. To find out your Maximum Heart Rate (MHR), minus your age from 220. To find out your Heart Rate Reserve (HRR), minus your Resting Heart Rate (RHR) (60-70 beats per minute generally) from your MHR. Now, to burn the maximum amount of fat during your workout, your heart rate must be between 60-70 per cent HRR + RHR (60). Hence, during a workout, you need to maintain your average heart rate between those figures beats per minute over a period of 20 to 30 minutes to be in your fat-burning zone and to get maximum out of your workout routine. Continuing the trend from last year, this year too, High Intensity Interval Training (HIIT) will be among the top favourites for training and to get maximum results. It’s very effective, time saving, can be done with and without equipments, and can be customised individually. However, HIIT can be taxing on the body at times, depending upon factors like the trainer who is conducting, intensity and frequency of program, fitness levels of the trainee, and the rest and work ratio during the workout. Also, how the rest days are planned. The whole program is safe and effective only if it is properly periodised. It has to be under the supervision of a certified trainer. Last but not the least, no program will be successful without a well-balanced diet. 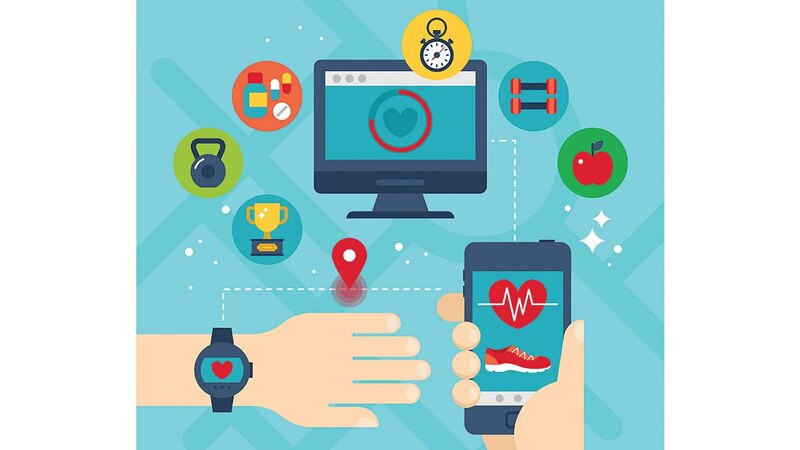 Many companies are coming up with improvised gadgets to track your workouts, ranging from wrist wearable watches, mobile apps, rings to bracelets. Garmin, Polar and Sunnto, Fitbit are the few most known and reliable ones in the market. Oura Rings is something that has come up recently, which tracks your sleeping and activity levels along with lot of other things. These apps and gadgets give you lot of information however, it is mandatory to listen to your brain and body. The body is the most brilliant of all the gadgets and apps put together. Your body will tell you exactly when to rest and when to push your limits making 2019 a successfully healthy year for your mind, body and soul. When you seamlessly amalgamate Pilates, hand weights, and cardio, you get a fun and really effective workout, Cardio Pilates. If all you want is to work up a sweat while sculpting the entire body, then go for this. This is a fine mix of Pilates-based exercise repertoire with some high intensity moves to get the heart burning and fat torching. The Pilates-based fitness moves are intense and powerful, known to follow a quicker pace than a traditional mat Pilates class. Body weight functional training exercises are also incorporated along with traditional strength training moves like squats, lunges, and push-ups to name a few. This age-old practice has ruled the fitness industry for many years. With novel forms of yoga like Power Yoga, Yogalates, warrior sculpt, Hot Yoga and more, these soulful postures will help in building bodily and psychological robustness, will recover awareness, willpower and full-body co-ordination. Catering to the population belonging to the community of older adults, these programs facilitate the seniors to uphold bone density and muscle mass as they begin to age. They also help them reap the manifold health advantages that come with being energetic and active. The most positive trend I think will be fitness enthusiasts not falling prey to fad diets. With experience, it’s seen that people are more open and have the urge to learn something about new about health, nutrition and fitness. More people are turning to Veganism and giving up dairy. We have a mixed crowd who switch due to religion and/or on spiritual grounds, some think it would help in fat loss, and some who do understand the bio-individuality of their bodies and drop these to honour their body needs. The sugar market is huge and consumption of sugar occurs in various forms. This will still take some time to calm down. Hence, it’s imperative to educate and create awareness and experts must take personal responsibility for the same. Lastly, it is likely that the consumption of organic produce will increase. The Keto/ Ketogenic diet was the most popular diet craze of 2018, and it will continue to stay as the most effective plan for weight loss in 2019, too. It is also called HFLC or High-Fat, Low-Carb Diet. Here, one is allowed to eat foods that are high in fat, moderate in protein but low in carbohydrates. The emphasis is not on starvation of calories but starvation of carb-rich food. So while butter, eggs, cheese, nuts, yoghurts are all highly recommended in this diet, intake of roti, rice and even fruits is restricted. Why you should not follow it? While it is true that you may initially lose some weight, this weight loss is only temporary and does not sustain in the long run. It also comes with side-effects.